Carnival Cruise Line has unveiled a new look designed especially for its staterooms onboard Mardi Gras, the cruise line’s new ship scheduled to debut in 2020. At 180,000 tons, more than 1,100-feet long, and with a passenger capacity of 5,200-plus, Mardi Gras will be the largest of Carnival’s vessels. And judging by the ship’s livery and the design of its new staterooms, it will also break the mold from other Carnival ships. For the new ship’s private spaces, Carnival tapped UK-based DCA Design International, asking the them to create guest-friendly experiences with ergonomically-friendly designs and space-saving features. In short, the design looks like a more modern take on the design of a cruise ship cabin. In addition to the new cabin design, Mardi Gras will have the widest variety of accommodations of any Carnival ship. The new vessel will continue Carnival’s emphasis on family-friendly accommodations, with 300 pairs of connecting staterooms. Meanwhile, 70% of cabins will have either a balcony of an ocean view. Plus, Mardi Gras will also continue the popular Havana, Family Harbor, and Cloud 9 staterooms introduced on Carnival’s Vista-class ships. For those unfamiliar, Havana staterooms feature a tropical ambiance, and have exclusive access to a pool and deck area only for guests staying in these rooms. The Family Harbor rooms are ideal for family traveling together and features the Family Harbor Lounge where guests can enjoy snacks (and some meals) during the day, as well as board games, movies, video games, and more. Finally, Cloud 9 staterooms have their own decor and are focused on relaxation and well-being, with spa bathrobes, slippers, and Elemis toiletries. In all, Mardi Gras will also boast more suites than any current Carnival ship, with over 180 across the ship. The cruise line also plans to announce further details of Mardi Gras’ premium-level Carnival Excel Suites — an entirely new class of suites — next month. 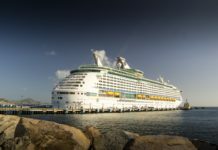 Following its debut, Mardi Gras will sail Caribbean voyages sailing from its homeport in a new state-of-the-art terminal in Port Canaveral. You can read more about the new features of the ship here.